In the clinic and school-based setting, each patient and child we see is different. Individuals come to occupational therapy with a different set of experiences, perspectives, and even sensory systems functioning when compared to others. This is why I like occupational therapy. You may recall the discussion about sensory experiences and sensory systems from your education. Sensory experiences are an inherent part of daily occupations and activities. Sensory systems are responsible for processing the sensory information and experiences we find in daily life. For each of us, our sensory systems are unique and we may have different responses to each of our sensory experiences. For this reason, your patients — whether adults or children — may react differently to the same stimulation. In some cases, sensory responses may be considered maladaptive and inhibit a person’s ability to fully engage in an occupation. No two clients are the same! Examples of sensory responses impacting occupational function may range from a child’s decreased participation in dressing tasks due to non-tolerance of scratchy or stiff clothing, to an older adult having difficulty remaining awake and engaged during feeding tasks. There are a wide variety of sensory system types and combinations. For the purposes of simplification, this article will discuss three major groups of sensory categories, how to identify these groups and help your patients navigate their sensory experiences, and the variety of available online resources. If a patient is demonstrating maladaptive sensory behaviors that are impacting their participation in occupations, a therapist must first determine which sensory category their patient may fall into. This is completed via observation, skilled occupational interview, and communication with parents, teachers, and/or caregivers. There are also several assessments, with a common example being the Adult/Adolescent Sensory Profile. Once the sensory category is identified, use your clinical judgment to determine what intervention technique might help your patient increase participation in occupations in the clinic, classroom, home, or work environments. When an individual is over-responsive to sensory input they may have a sensitive tactile system, they may show signs of distress in busy, loud, and bright environments, they may be easily distracted, and they may be fearful of playground equipment including swings or jungle gyms. Individuals who are under-responsive to sensory input may seem lethargic, unmotivated, and/or it may be difficult to get and retain their attention. 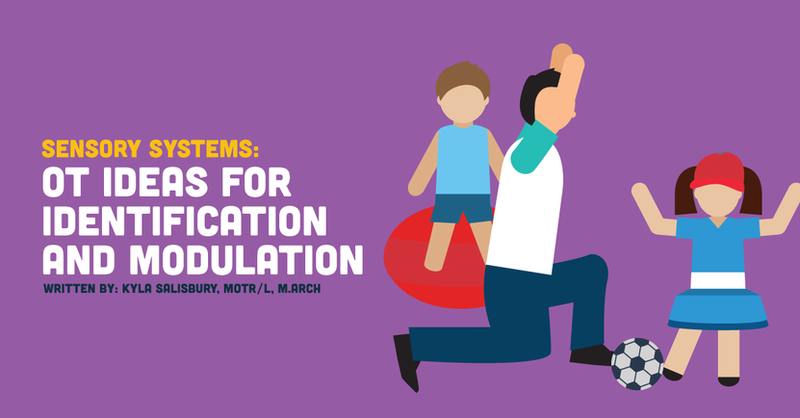 To help share knowledge and understanding of sensory systems with parents and teachers, I’ve compiled a list of online resources. These websites discuss sensory systems in patient friendly language and provide resources and forums for therapists, parents, and teachers. Therapeutic listening is a sound-based intervention tool that is used to assist patients with self-regulation and modulation of sensory experiences. This website offers information portals for therapists and parents, as well as continuing education courses for practitioners. The STAR Institute for Sensory Processing Disorder offers a website full of information including continuing education, treatment ideas, and the latest research related to sensory issues. The Alert Program includes resources for parents, teachers, and therapists. Resources are used for instructing patients in self-regulation and sensory diets to improve attention, coping strategies and executive functioning.